A new online radio service launched this week: Mad Genius Radio. It is technically and legally a non-interactive online radio platform (like Pandora). 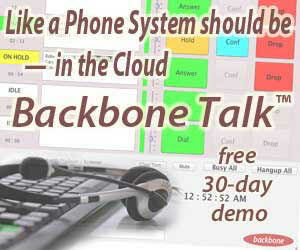 But the interface invites much more customization than other lean-back services. It is fun, addictive, and an interesting new user experience in streaming audio. Note: some readers pointed out to RAIN that Mad Genius Radio resembles Radical.fm in its key multiple-genre feature described below. Radical.fm is not currently available as a web app, but the company told us that its mobile-only service will extend to the desktop soon. Now, you can find Radical.fm in iOS and Android versions. The central innovation of Mad Genius Radio is the creation of stations that mix genres. In Pandora, the market-leading Internet radio service, you create stations based on an artist or song. Pandora’s Music Genome engine then spools out a dynamic playlist based on music attributes and your particular taste — it gets smarter about you over time. Pandora is hugely popular, and in our view the Genome is remarkably successful. But it does not generally cross genre boundaries. Mad Genius Radio’s curation philosophy is that people like many kinds of music, and enjoy being surprised in a playlist. Users set the boundaries of surprise by specifying up to seven genres per station, and shape the emphasis with sliders that bring more or less of each genre into the station. It is like a mixing board for your personalized music station. This key innovation feature plants a stake in the middle ground between non-interactive and interactive services (e.g. Pandora and Spotify). You are not quite creating an on-demand playlist, but the resulting music experience can be as eclectic as an adventurous Spotify playlist. 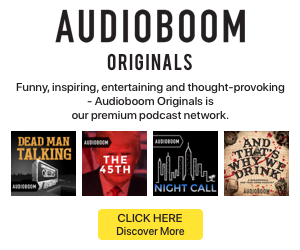 There is a clever on-demand aspect to mad Genius Radio as well — it’s a Request feature. 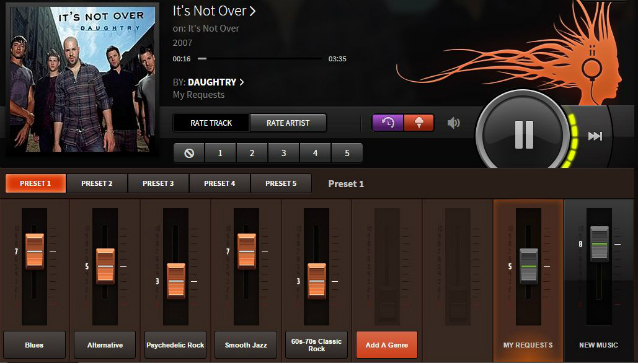 The platform can offer dozens of hit tracks (called Guilty Pleasures) that the user requests, and those songs will get programmed into the mix. Unlike a truly interactive service, you cannot play them on instant demand or save them. Track rating is supported — along with a paired feature that allows rating the track’s artist or band. Unlike simple thumbs-up and thumbs-down, tracks and bands are graded on a 1-to-5 scale, and you can eliminate any song from appearing again. If there is a weak spot in all this inventive goodness, it is the genre selection, which is incomplete and very broad. So, for example, we didn’t find World Music. Another genre staple, Blues, does not offer sub-genres that we could find. As a result, we heard too much scratchy old-time blues croaking and not enough modern blues rock. But wide categories contribute to the serendipitous “surprise” factor, and the rating system quickly tailors listening over an afternoon of use. More felicitous surprises abounded. In both the Blues and Smooth Jazz categories, Mad Genius delivered non-standard repertoire, where other services tend to cycle through the big-selling hitmakers. We discovered music. We were reminded of songs we hadn’t thought of in years. We had a blast with this thing. Try it. 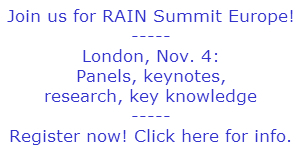 Um… you guys at RAIN have heard of Radical I presume? Ummm… Did you not read the article? Sean, aparently it did not occur to you that my comment was posted before RAIN added their note. Mad Genius. That’s a joke. More like Mad Rippoff. Bad form here. Radical.fm has this exact player . Unreal! !.